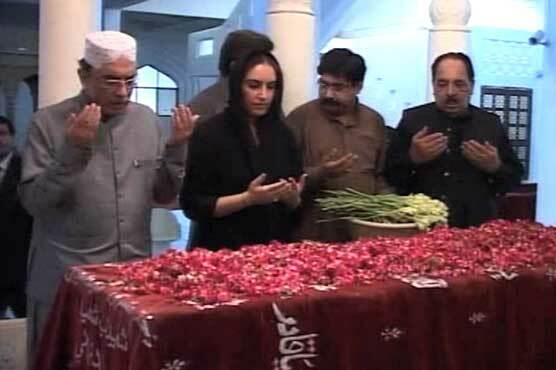 NAUDERO (92 News) – Pakistan People’s Party co-chairman Asif Ali Zardari has said that all murderers of Pakistan People’s Party’s (PPP) slain leader Benazir Bhutto have gone except for one. Addressing a gathering at Naudero house on Sunday, Asif Zardari said that the children of slain PPP leader and masses are with him and no one has to worry. Former president said that no one can withdraw the FIR of murder of slain former prime minister Benazir Bhutto. Zardari said that Benazir Bhutto had nominated people including former president Pervez Musharraf she believed would harm her in her life, adding that all but one of the murderers are gone.